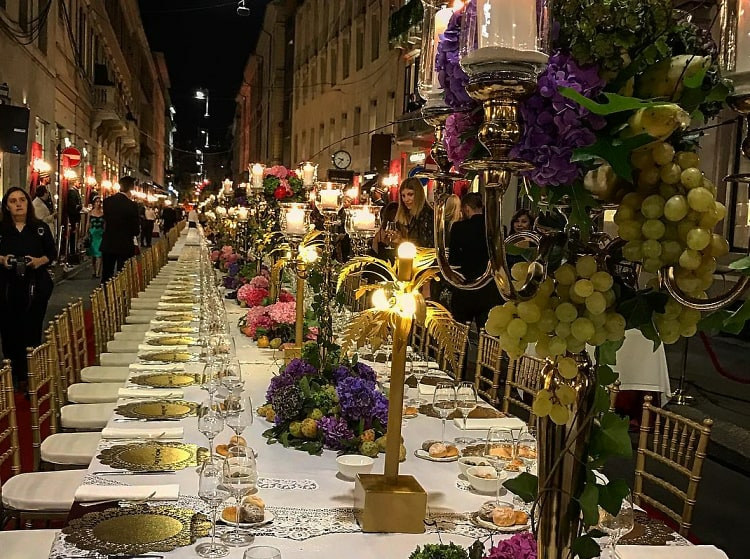 No brand is more proud of its Italian heritage than the one and only Dolce and Gabbana, so it only makes sense that, following a runway show filled with pasta prints, designers Domenico Dolce and Stefano Gabbana closed out Milan Fashion Week with an epic feast. One that shut down an entire city street, no less. Toasting to their spring 2017 collection as well as the label's new store on luxury shopping block, Via Montenapoleone, the masterminds invited 400 of their closest and most fashionable friends, including Sofia Richie, Hailey Baldwin, and Luka Sabbat, to dine al fresco on light Italian delicacies and to take in the whole visual masterpiece. Jury is still out on whether anybody actually ate anything. In any case, ciao, Milano!